Money is one of the major sources of conflict in a marriage or other similar arrangement. (Don't get me started on my ideas about marriage... that's another post entirely.) J-bird and I decided in the beginning, before we got married, how we would handle our married money. We lived together before we were married (gasp! ), but we didn't merge our money until we were legally bound to one another. In our days of sin, we kept our money separate and each of us were responsible for bills based on what we earned. We sat down and negotiated those responsibilities when we decided to live together. Whatever other money we were able to spend freely. Unfortunately, in the early days, there wasn't really any extra money so we didn't fight about that. On top of almost no extra money, J-bird had $10K in credit card debt, most of which he accumulated while we were dating but not living together. I refused to help him pay any of it until we were married. You know, just in case. So we had student loans and a good amount of credit card debt when we got married. We decided how we would set up our finances on a car ride home from visiting parents, where most of our good financial conversations still take place. We kept our separate credit cards, adhering to the rules that joint purchases are discussed and individual purchases on credit cards must be reimbursed from allowance accounts. I also became an authorized user on J-bird's "big" card that we now use for our daily purchases and pay off every month. With our allowance accounts, we used to each get the same amount every month. Now, I get less as I don't need money to eat lunch with work colleagues. I can take my allowance money out of the bank and light it on fire if I want and J-bird can't say a thing about it. That's the rule for allowance money. 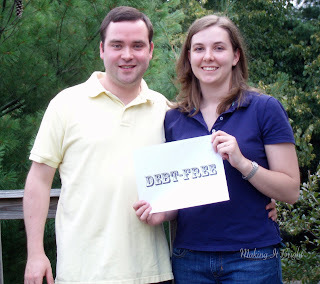 We worked like crazy to pay off $10K in credit card debt and some medical debt that was incurred after we married. Pasta and potatoes for dinner, no real extras. 15 months after we married, it was gone! That was huge because we weren't making any money at all. Of course, that debt freedom was relatively short-lived because as soon as we saved money for a down payment and J-bird got a better job, we bought a house and a car, had a baby, and shifted to one income. :) All of that occurred within a 15-month span. We're still committed to no credit card debt. We have a car loan (which we're working to pay off ASAP), a mortgage, and student loans. All other debt is pretty silly in our book. And in addition to continuing to build our emergency fund (I'd love to have a year's expenses), we've also started saving more for our retirement and for Goose's education. I'm the Chief Financial Officer (CFO) for the family but that's because I'm a bit of a control freak and won't let J-bird handle it. Also, when I moved in, he had several late bills, which I just could not understand. How do you pay a bill late? So it just makes more sense in regards to personality and time commitment for me to continue to handle our finances. 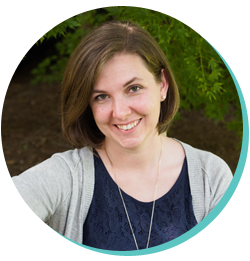 We discuss goals and long-term plans together, but I manage the day-to-day handling of our finances on my own and without consultation. And for the first time in our lives together, we have a real budget that we're actually trying to stick to. So far, so good, though there is always room for improvement. This system works for us, but we realize that it's much like parenting--you do what works for your situation. We really haven't fought about money all this time, after nearly 5 years of wedded bliss. The most recent topic of discussion is that I'm too frugal but I don't think there is such a thing. :) I'm the saver, J-bird is the spender. We know our roles and fully acknowledge what that means for us. How do you handle your "couple money"? What advice would you give others? that's awesome, kandace! it sounds like you guys have your money issues together. most couples have no clue what to do when it comes to money and just sort of "wing it," which is pretty much the worst idea ever. for us, we follow the dave ramsey program (go to www.daveramsey.com to get more info). our eventual goal is to have no debt whatsoever. we've saved an emergency fund, got our insurance issues in order, and we're now paying down all of our debt. by september to january, we'll be out of everything except for our house, and then after funding our emergency fund a little more, we'll be paying down the house, too! i can't wait!! we haven't used credit cards for any reason in almost 4 years. i completely understand the logic behind keeping one and paying it off, but we don't have that kind of will power. we never paid it off, and for us, it just seemed a little too close to the fire. rick travels quite a bit, and everything that you could use a credit card for, we've used a debit card. we do all of our bill paying online. we're still a work in progress, but we're getting there and are super passionate about teaching our daughter about giving, saving, then spending. we have "commission" for her and at the end of the week, and she gives the first 10% to tithe, another 10% to savings, and she saves the rest. she's been saving for about 3 weeks now for a certain ariel doll, and she still has 3 weeks to go, but we're so proud of her! okay, there's my mini-post about money. you hit a passionate area of ours -- we've made such mistakes with money and have learned a lot in the meantime. you guys seem like you've got it together! Shaina-- That's great! We're still not where we want to be, but we've never really fought about money. Nice. We've read Dave's books and I love to listen to his radio show. We tried cash for a month or two but it's just not for us. I think it's great that you've made it work for you. I think money is one thing we don't talk about enough. We learn by sharing.